The Wirehaired Pointing Griffon (WPG) is a strong hunting dog. The skull is slightly rounded on the top, but looks square in profile when it is viewed from the side with the muzzle. The head is in proportion to the body. There is a slight stop. The nose is brown with wide open nostrils and the teeth meet in a scissors bite. The large, round eyes range from yellow to brown in color. The medium-sized ears are set at eye level, hanging down and lying flat against the head. The neck is long, without dewlap. The body is slightly longer than it is tall and the back slopes slightly from the shoulders to the rump. The front legs are straight with round, webbed feet. Dewclaws are usually removed. The tail is customarily docked by 1/3 to 1/2 its original length and is a continuation of the topline, carried straight or raised. Note: docking tails is illegal in most parts of Europe. The medium-length, course, rough double coat has soft, thick, bushy eyebrows, beard and mustache. Coat colors come in steel gray with brown markings. The brown can be shades of chestnut brown or roan. It can also come in white, solid brown, white and brown or white and orange. 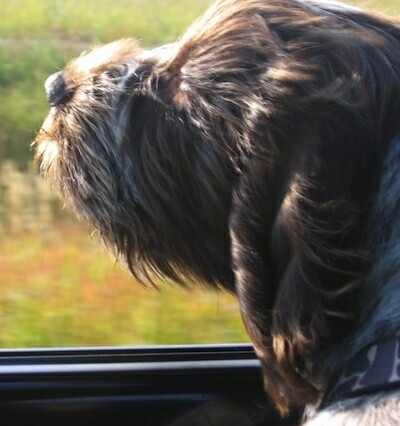 The Wirehaired Pointing Griffon is a loyal, skilled energetic field dog. It is intelligent and makes a distinguished gundog and tracker. These excellent hunting companions can point and retrieve with a deliberate style, generally staying within the hunter's gun range. Especially good for hunters on foot, it combines the ability to be directed by the hunter with the ability to think independently. It has an exceptionally fine sense of smell and a great passion for the hunt, especially for quail and hare. Friendly, lively and active, the breed works well in marshland and upland, and is a fine pointer, flusher and water retriever. 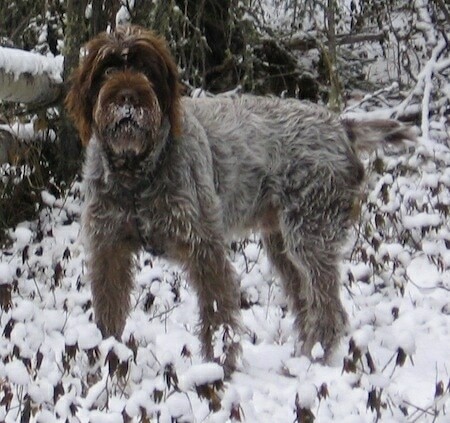 The Wirehaired Pointing Griffon's coat protects him from dense brush and bad weather. Very loving, it is also an excellent family pet, gentle and affectionate with children. It is very eager and willing to please and is easily trained. 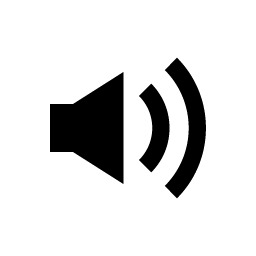 If not properly socialized, exercised and given enough mental stimulation, it can be rather high-strung and nervous with strangers and unfamiliar situations. Dogs that do get enough exercise are generally friendly toward strangers, other dogs and pets. Socialize extensively when young and be sure to always be the dog's pack leader. This breed is an excellent watchdog. Some lines are prone to hip dysplasia. The Wirehaired Pointing Griffon is not recommended for apartment life.Will not do well left in a kennel or backyard.It is moderately active indoors and will do best with at least a large yard.It prefers cool climates. 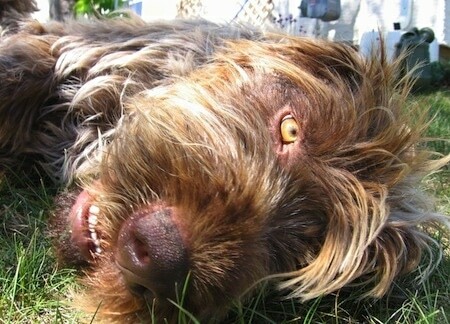 Wirehaired Pointing Griffons are super high-energy dogs. They need to be taken on daily, long, brisk walks or out for a run. They will make excellent jogging companions and love to swim. If these dogs are allowed to get bored, and are not walked or jogged daily, they can become destructive, high-strung and start to display a wide array of behavioral problems. Brush and comb the harsh coat once or twice a week. The ears should be cleaned and plucked of hair within the canal in order to avoid ear problems. Show dogs need stripping and trimming. Some pet owners have their dogs professionally groomed once or twice a year to keep them looking their best. The Griffon sheds little to no hair, but must be stripped so new hair can grow. The Wirehaired Pointing Griffon was developed sometime around 1870 by a Dutch breeder named Eduard Korthals. An enthusiastic hunter, his goal was to breed a dog that would hunt in all kinds of terrain. Korthals mixed German Griffons, French and German Pointers, Spaniels, Barbets and a Setter. He developed the Wirehaired Pointing Griffon in his breeding program in less than 20 years, writing a standard, and in 1916 formed the Griffon Club of America. The dogs excel in small-game hunting, such as hare and quail; they are eager hunters with fine noses. That same year he showed sixteen Wirehaired Pointing Griffons at the Westminister Kennel Club Dog Show in New York. 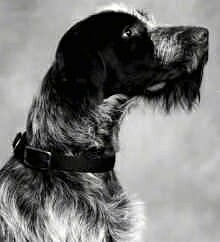 In the 1980s a select few breeders decided to mix the Cesky Fousek into the Wirehaired Pointing Griffon lines. 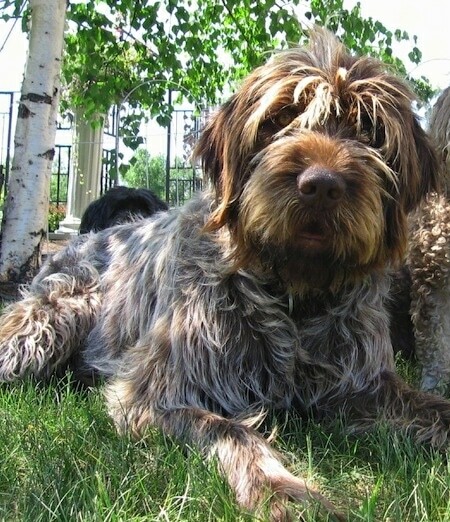 This caused an uproar and the American Wirehaired Pointing Griffon Association was formed with the goal of preserving the purity of the original breed. 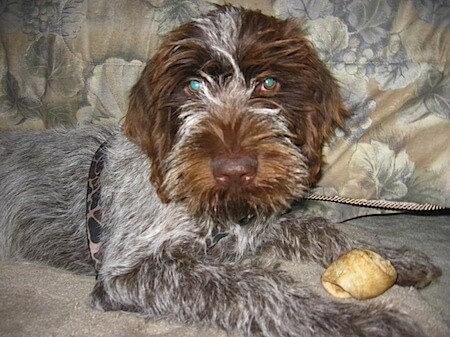 The American Wirehaired Pointing Griffon Association is the AKC parent club for the WPG. 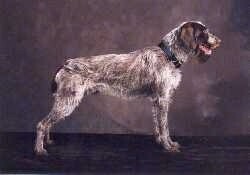 The Wirehaired Pointing Griffon was recognized by the AKC in 1887. This is Madix with his cousin Arrow. Madix is about three months old in this picture and Arrow is just over a year.